Ongoing classes in Los Angeles 2x a week! A class to release your fear, understand & relieve your anxiety & develop your nervous system strength to take courageous action! Limited Private Consultations: Simple, Powerful and unique yogic tutorials. Simran listens deeply and assess your posture, alignment and limitations, and shares helpful postures, ideas, concepts, meditation and remedies to help you heal and change your challenges into advantages. During this eleven-day, meticulously designed experience, we will condense down six months of TDL Mentoring into 11 days. The value of immersion is that there are no distractions. You are fully focused on YOU for 11 days. 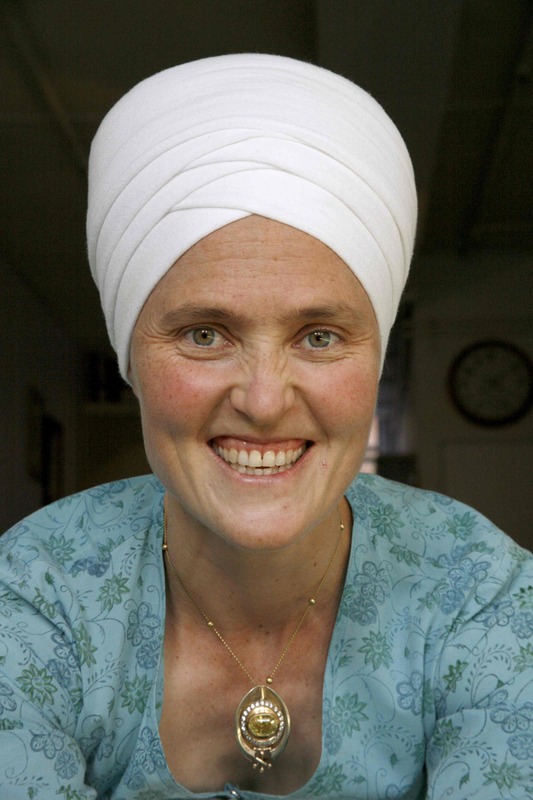 We will be doing powerful and transformative Kundalini Yoga Classes to break through our perceived limitations! Teacher Training in Herndon, VA April 1st, 2nd & 3rd, 2017 - Divine Alignment & The Heart Rules! Breath, Bandhas, Asana - An indepth 2 days of how to approach Kundalini Asana's, breath and meditation positions. Tools to have a fun and safe Yoga practice. Learn the secrets of the sacred power within you, a base to build a comfortable practice & life upon. Let your Heart Rule and find the ease that flows into your asana, meditation and life. Help you grow as a yogi and teach an infinitely better class as a teacher. Come and learn with one of the best second generation yogis anywhere! Asana, Postures, Breath, Bandhas, Dristi & Mantra! Morning Workshop Location: Kariang Bottom "The Heart Rules - Develop Empathy & Compassion"
If you want to develop compassion, first develop it for yourself. What you hold in your heart is directly related to how you your heart. Recognize the limiting patterns(mental & physical) that physically alter and restrict you, and as we work with Kundalini Yoga done correct, we can consciously let go of unnecessary tension, changing what you hold in your heart & thus how you carry you heart. When you are hurt, afraid, angry, stressed you are often in a state of shame, blame and guilt. Get out of those cycles and start vibrating your Truth and live in a state of grace, forgiveness and surrender. Watch how you begin to feel free, your life moves more in the flow and you experience Sahej, the easy acceptance of all. We will use Kundalini Yoga, meditations, pranayam, prayer, music and relaxation. Bring note book & pen. Great class for an easier White Tantric Yoga! 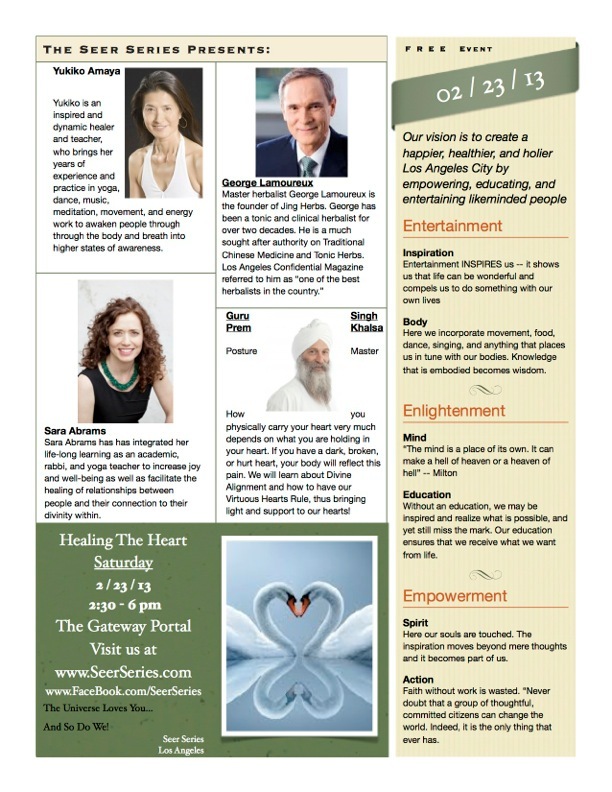 Divine Alignment & The Heart Rules Workshops, we will have details soon! Teacher Training in Cincinnati, OH! April 1st, 2nd & 3rd, 2016 - Divine Alignment & The Heart Rules! Breath, Bandhas, Asana - An indepth 2 1/2 days of how to approach Kundalini Asana's, breath and meditation positions. Tools to have a fun and safe Yoga practice. Learn the secrets of the sacred power within you, a base to build a comfortable practice & life upon. Let your Heart Rule and find the ease that flows into your asana, meditation and life. Help you grow as a yogi and teach an infinitely better class as a teacher. Come and learn with one of the best second generation yogis anywhere! - Do asana’s you thought you couldn’t or were afraid to try! - Learn how to love ourselves, NOW! Help you grow as a yogi and teach an infinitely better class as a teacher. Come and learn with one of the best second generation yogis anywhere! Special Course Asana, Postures, Breath, Bandhas, Dristi & Mantra! Learn the secrets of the sacred power within you, a base to build a comfortable practice & life upon. Let your Heart Rule and find the ease that flows into your asana, meditation and life. Discover how to make a sacred sacrifice and the power it can unlock. Develop your latent true self, align yourself physically, mentally, spiritually and watch your destiny follow! 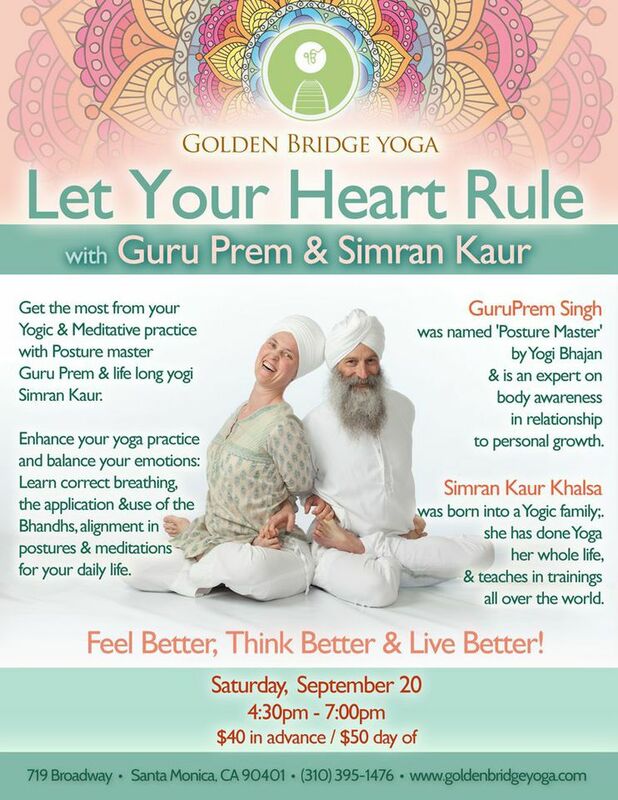 Join GuruPrem and 3 other amazing teachers for an afternoon of Healing our Heart! How you physically carry your heart, very much depends on what you are holding in your heart. If you have a dark, broken or hurt heart, your body will reflect this pain. Our 1st Official Chant Night! 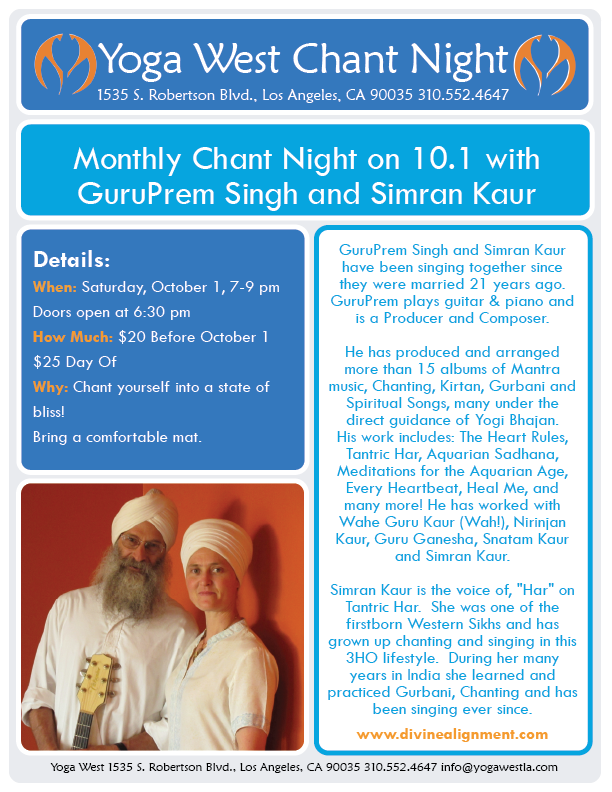 After 21years of chanting and singing together at Solstice, Gurdwara and at Yoga Courses, YogaWest Los Angeles asked us to come back and lead our 2nd Chant Night! Simran Kaur and Guru Prem Singh are so excited to be gathering in the company of the holy to chant and sing together. We hope you can join us for a beautiful evening of chanting, singing, songs & stories! Yogi Tea and cookies!